Joyal Beauty Super Brightening Vitamin C Serum is a powerful concentrated delivery system for the highest form of active, stabilized, bio-available Vitamin C boosting collagen production and increasing elasticity and firmness. It is also enriched with vitamin E, ferulic acid, pure vegan hyaluronic acid and many anti-aging formulas to plump skin cells and restore cells. Our potent plants-derived ferulic acid incorporation into the topical solution of vitamin C+E improved chemical stability of the vitamins C+E and doubled photoprotection to solar-simulated irradiation of skin from 4-fold to approximately 8-fold as measured by both erythema and sunburn cell formation. This antioxidant formulation efficiently reduced thymine dimer formation. This combination of pure natural low molecular weight antioxidant provides meaningful synergistic protection against oxidative stress in skin and powerful for protection against photoaging.You will definitely see amazing radiant glow with your complexion within 4 weeks! This Serum contains the most active and stabilized Vitamin C--- which is critical for your body and plays an important role in maintaining healthy, resilient skin. While young skin is full of vitamin C, aging skin naturally loses this nutrient over time. Vitamin C is powerful in the production of collagen, a protein that gives your skin its elasticity. Stabilizing your skin's levels of vitamin C can help to counteract wrinkle formation by increasing collagen production. It is a powerful antioxidant, shown to reduce the number of sunburned cells as well as reverse age-related damage to skin. While it's not a replacement for sunscreen, vitamin C protects against and repair UV damage like discoloration and fine lines. Applying our vitamin C to the skin can be 20 times more effective than taking it orally. Proved reduce and restore sunburn cells up to 96%. Plump skin cells and increase elasticity. Provide deep moisture protection on the skin. This Serum contains the best plants-derived Ferulic Acid to DOUBLE the function! --- Ferulic Acid is a potent antioxidant found ubiquitously and at high concentrations in plants. Ferulic acid is a potent antioxidant with synergistic interactions with Viatmin C. It readily forms a resonance stabilized phenoxy radical which accounts for its potent antioxidant potential. Ferulic acid protected membranes from lipid peroxidation and neutralized alkoxyl and peroxyl radicals. It protected against iron-induced oxidative damage. Its incorporation into a topical solution of vitamin C+E improved chemical stability of the vitamins C+E and doubled photoprotection to solar-simulated irradiation of skin from 4-fold to approximately 8-fold as measured by both erythema and sunburn cell formation. This antioxidant formulation efficiently reduced thymine dimer formation. This combination of pure natural low molecular weight antioxidant provides meaningful synergistic protection against oxidative stress in skin and should be useful for protection against photoaging and skin cancer. Ferulic acid not only provides increased stability to a solution of vitamins C+E, but also adds a substantial synergistic photoprotection, essentially doubling its efficacy. Moreover it provides additional protection against thymine dimer formation that should prove useful for prevention of skin cancer. These studies support the hypotheses that UV radiation produces apoptosis by triggering the caspase cascade in both epidermis and dermis, and topical vitamins C, E, and ferulic acid can protect against caspase activation. Joyal Beauty Serums carefully choose dark amber glass pump bottle as packaging instead of dropper bottle to avoid the active ingredients exposure to air and light. Since we know all antioxidants, including vitamin C, are vulnerable to deterioration in the presence of air and light, the smartest choice is definitely dark container with pump so that light and air don't degrade them quickly. With pump bottle you do not need to open the serum cap every time when you apply, while opening the dropper serum usually increases possibilities of some ingredients exposure to more air and light. Also pump bottle is easier to control the usage compared to dropper bottle and avoid waste of serum. Sodium Ascorbyl Phosphate (Vitamin C),Methylsulfonylmethane (MSM),Cassia Angustifolia Seed Polysaccharide (Botanical Hyaluronic Acid),Organic Herbal Infusion,Organic Aloe Barbadensis Leaf (Aloe),Hamamelis Virginiana (Witch Hazel),d-Alpha Tocopheryl Acetate (Vitamin E),Carbomer,(2s)-2-Amino-5-guanidinopentanoic Acid, Ferulic Acid, Kosher Vegetable Glycerin,Organic Simmondsia Chinensis (Jojoba Oil),Phenoxyethanol, Ethylhexylglycerin. Not bad... 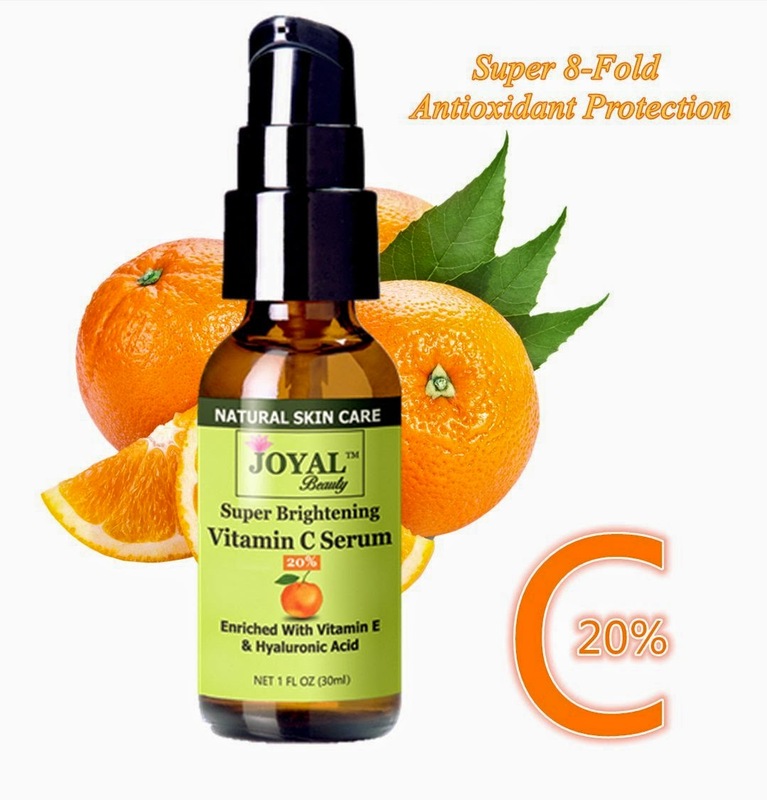 The Joyal Beauty Super Brightening Vitamin C Serum seems to do what it claims so far and I've only been using this product for just two weeks. I love that it has a lot of Vitamin C in because that's suppose to be really good for your skin. It comes in a nice little pump style bottle. The bottle is on the smaller size compared to previous serums I have used, but you do not need a lot to get the job done. It does have a scent to it, but it's not strong at all. The serum itself in on the thin side, a little more liquidy than I prefer. But, it goes on my face easily and absorbs quickly and it doesn't leave any kind of greasy or oily feeling on my face. I haven't noticed any difference with the wrinkles on my face, but I think it's to early to tell... But, I have notice my skin has a healthier, brighter look to it and my tone does seem to be improving. This product does also claim to reduce and restore sunburn cells up to 96%... I have not had the pleasure of a sunburn yet this year (yay!) 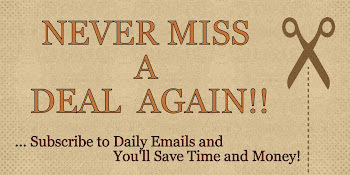 but when I do, because I probably will, I'm excited to see if this helps. Overall, nice product and I'll definitely recommend giving it a try. If you would like to try it out for yourself, you can purchase the Joyal Beauty - Super Brightening Vitamin C Serum right now from Amazon!